As many of you have already read in others posts of mine, as a long-term traveler, I do not look forward to certain aspects of returning to the United States for my yearly visits to family and friends. This has nothing to do with actually being in the US as, these days, I am able to thoroughly enjoy my time here as I bounce up and down the east coast for a few weeks. And while it still is true that every visit to my home country requires me to re-adjust to what has now become more of a foreign culture to me than many of the cultures I spend so much time immersed in overseas, again, even this ‘reverse culture shock’ or readjustment period is nothing I really dread. What does make me hesitate about returning to the US is the experience of passing through US Immigration & Customs at the airport, an experience that, more often than not, is an unpleasant one given my extensive travel history. I’ve now visited enough ‘unfriendly’ or ‘suspicious’ lands to warrant a harsh line of questioning, thorough inspection of all my belongings, having my laptop turned on and all the files examined and on that one special occasion after spending some time traveling through Pakistan and Afghanistan, an intense and disturbing interrogation. Naturally, when my flight arrived in Fort Lauderdale, Florida the other day (coming from Mexico), as excited as I was to see my family, I could not help but notice the building nerves that spread throughout my body as I walked from the arrival gate to the Immigration line. My palms became sweaty, my heartbeat increased and I reminded myself of the importance of staying calm if I was once again treated harshly by an Immigration Officer. The line at Immigration this time was unusually short and after a three minute wait, I soon found myself standing in front of an Officer who immediately took my passport and swiped it into his computer system. And then, without a word, he flipped through the pages of my passport until he discovered a visa stamp that caught his attention. Immediately, I prepared myself for another interrogation and had a feeling that this was going to be another hellish trip through US Immigration. However, after answering “No” to this question (not that the answer should make any difference whatsoever), the Officer didn’t say a word and before long, I realized that this was, in fact, not going to be a typical US Immigration experience for me after all. After flipping through my passport some more, and asking me to identify what countries many of the stamps belonged to (as some of the stamps from last year’s visit to the Middle East, such as Syria and Lebanon, are written almost entirely in Arabic), this calm Immigration Officer then asked me a few more specific questions. And as I always state, I have no problem at all with any Immigration Officer asking me questions. I would ask myself questions as well if I saw my passport. But it was the manner in which this Immigration Officer asked these questions that actualy made this trip through Immigration a…pleasant….yes, I would go as far as to use the word ‘pleasant’….experience as opposed to what I’ve experienced before. While it is true that I was kept at his Immigration booth for a significantly longer period of time than most of the other US Citizens passing through, I must state that, for the first time that I can recall, I was treated with nothing but respect and courtesy, which is exactly what should happen according to the US Customs & Border Patrol’s “Pledge to Travelers”. Eventually, the Officer handed me back my passport and wished me the best of luck in my travels, having never raised his voice, never making any accusations and never treating me as a threat to my own country simply because of the diverse collection of stamps in my passport. And while this may not be something that many people spend much time thinking about, the manner in which I am treated upon arrival in my home country makes a huge difference to me. It’s frustrating to spend such significant time trying to educate myself first-hand about the world, only to be treated like a criminal for doing so. Also, I want to know that the borders of the United States are protected by people who understand the value of international travel, not by close-minded individuals who automatically feel threatened upon seeing one passport stamp in Arabic. Well, I am happy to report (ecstatic, in fact) that I finally encountered the type of Immigration Officer that should be cloned thousands of times and placed at every airport and land border crossing in the country. While still doing his job effectively (after all, he wasn’t asking me questions out of personal interest), he not only made me feel welcome in the country of my birth, but made me feel as if my life of travel was not a crime, but something worthwhile and truly valuable. Of course, it’s somewhat disappointing that such a positive US Immigration experience stands out as something extraordinary and completely surprising, but it’s a start. Perhaps this is an indication of a shift in attitude within the US Customs & Border Patrol agency (CBP) that just might help make entry into the United States more bearable for everyone. Do you have a recent experience with US Immigration or any other country’s Immigration that you want to share? I’m glad that you had such a ‘pleasant’ experience. Immigration procedures tend to scare me for some reason so I thought I was going to get grilled by the officer upon my arrival at the immigration area, but surprisingly enough he was calm and polite. I was with my family and we had brought our dog with us. This officer looked “happy” upon discovering that we had brought a dog! And not only did he wish us ‘best wishes’ he jokingly said that he would visit us. I thought that was pretty funny. All of your personal stories are appreciated, but does anyone here know the REASONS for the ugly questioning of US citizens returning home to the US? Hey Martin – I certainly know the reasons. But I’m not complaining about the questioning at all. I’m just pointing out the unnecessary manner in which it is done. Other countries out there are also dealing with potential threats all the time, but somehow they are able to maintain a little more civility when dealing with those at the border. So I went shopping in the U.S again last weekend and at the crossing the ONLY thing the U.S agent said was “purpose” and I said “beach.” I was through in about 8 seconds. It was almost to easy…. Coming back to Canada that trip however took A LOT longer. Long story short, the lady at the gate had no idea what I mean by wine cooler…. I appreciate everything about this blog post. With a spouse who is a non-US citizen, I have done my share of international traveling and I always dread the immigration counter, and I’ve never even been individually interrogated. Why do they have to be so rude and cold every time? The officers who stamp my passport as I enter my husband’s home country are always much friendlier than anyone who welcomes me back to the US. My worst experience was actually crossing the US/Canada border by car last year, after a weekend in Niagara Falls for a magazine assignment (I’m a writer). The US agent sneered at me like I was some kind of criminal. I once took a trek into the U.S at the Peace Arch border Crossing in BC Canada. I was going shopping with two middle aged women and their then 14 year old daughter. I told the U.S Officer the purpose of the trip was shopping since I was driving the vehicle, and he had a great sense of humour, saying humorously “why would you decide to go shopping with a bunch of women? You’re gonna be bored silly, I mean wouldn’t you know by now that a man is in and out in five minutes and once a woman gets into a store she spends five minutes window shopping then five hours later…” So then I said to the Customs Officer “well at least we’re not going to a Fabric Store” then he says “it doesn’t matter if you’re going to a Fabric Store!” We all had a good laugh and were on our way. I believe “Sharp” was his name. I mean from the stores I’ve heard you usually don’t come back from a trip and say “wow you know Customs was the best part of the trip!” But we can. What a fun day that was. Hi. After reading all the posts, I don’t see an answer to the most fundamental question: WHY the questioning of american citizens entering their own country? Anyone knows the reasons? On my last reentry to the US (Miami airport), I was asked these questions by THREE immigration and customs officers: 1. Where are you coming from? (Ecuador). 2. What were you doing there? 3. How much money are you carrying? 4. Do you have family there? (No) 5. Do you have friends there? (Yes) 6. How do you know them? More intrusive questions followed. I mean, I’m a US citizen returning home, so why such questions? Can you imagine any other country asking this their own citizens? Anyone has any explanation for this, or what’s the reasoning behind it? I find this outright unacceptable. It is sad to hear that that’s not the norm. Good for him, though. It’s nice to see people doing their job in a respectable manner. After being overseas for 2 years in Australia and New Zealand (notoriously “good” countries) I had a funny experience coming home. When asked where I was going to live, I grumbling said, “with my parents” and the officer kind of chuckled:). Hey Rebecca – That must have been funny…I guess you were left walking away from immigration with your head down! While returning from El Salvador via Houston, I encountered a young burly agent who looked over my deceleration form with great suspicion. When he noticed I had declared carrying $0.0 in currency, he went on to ask me if I had any money in a wallet or pocket. When I answered yes, he went on to inform me that small change was currency. To think, I could have been detained for carrying 2 portraits of George and one of Lincoln. At least your situation didn’t turn out worse! I have to agree with you the worst part of traveling is having to come back to the US and go through customs. Never have I been welcomed back to the US.After traveling through Malaysia it got worst I guess because they have about 50% Muslin population the guy says you’ve been to Malaysia then calls someone else over and the start of the hour search of my things computer camara etc.So when I was flying back from Manila to Honalulu last week I was dreading it.To my shook I got off the plane went into customs no one was there except a few agents I went up to one and he was very nice looked at my passport and asked if I had cigarettes and I told him I had 3 cartons he said you are only allowed 1 and I told I had 3 friends that smoke and they always look forword to a 7.00 carton of cigs. He said just watch it next time and welcomed me back home. I picked up up luggage took it to the ramp for the flight to the mainland and was out the door in about 15 minutes.I read about a year ago that Disney was going to train customs employees on how to treat people maybe its working. Man, Erica and I have had nothing but negative experiences in the US from Immigration Officers. I would guess it has a lot more to do with our physical appearance than our passport stamps, but without fail it is an ordeal every time. I think we’re gonna consider flying into Florida and try our luck there too when we eventually head home, lol. Glad to hear you had a pleasant experience! I just managed to catch your blog and read a few articles – good stuff. Anyways, my travels have been mostly to Europe, so I haven’t really had many interactions with US Customs and Border Protection; in fact, there’s only been four. The first time my friend and I were crossing into Maine from a land border with New Brunswick and we gave the officer our driver’s licences (this was before you needed a passport to enter the US) and he asked the standard questions. He then asked if we had tobacco and I said that I had cigars and he was going to search the bag quickly, but then he asked if they were Cuban and I said no, so he didn’t bother searching and said, “Alright. Welcome to the United States – enjoy your trip.” This was my first encounter with immigration, so I figured it would be like that all the time. The officer was nice and very friendly; granted, he was pretty old, so maybe it was just part of his nature. Two years later I crossed the land border from Fort Erie into Buffalo (which apparently is notorious for CBP officers with attitude). We got to the booth and gave our passports to the officer and she asked us our citizenships and we both said Canadian; she must not have heard us, because she started yelling, “I’m not going to ask you again, what is your citizenship?” and we both answer Canadian again a bit louder so she can hear us (although I’m thinking, “You’re holding our passports that has CANADA written on the front – put two and two together” – I obviously didn’t say that, ha). She asked us what we were going to do in Buffalo and how long we were going to spend there; we just said we were going to look around and explore for a few hours (bad answer, I know) and she said there’s nothing in Buffalo and we had to be more specific, so we just said shopping and a boat tour (I read about that, so it sounded like a good idea). Anyways, we got sent to secondary and both my friend and I were waiting until they called us up. We both got questioned separately about how we knew each other, our jobs, our intentions in the United States and all that. After about 20 minutes, we were both called up to the counter and the officer said, “After reviewing the facts, we see no reason to deny you entry. Welcome to the United States of America.” After all that, it didn’t seem worth it. Just in May, I was going to Europe for my holiday and I decided to transit through the United States since it was cheaper than flying directly out of Canada (which made no sense, but whatever). I got to the airport in Edmonton (we have CBP pre-clearance at the major international airports) and waited in line. The officer called me up and just asked me why I was going to Europe (I was wondering why she cared, but whatever, I answered the question) and just went through my declaration card asking me the questions again. After that, I was on my way. My friend at the other booth got a bit more of an interrogation asking him about what he does for a living and how he could afford a lavish trip to Europe. Coming back from Europe, we landed in Chicago after a 10 hour flight from Frankfurt and my friend and I were at the back of the plane, so we were at the back of the immigration queue (and two other international flights came in, so it was long). After about an hour, they finally asked Canadian citizens to go to the flight crew line to be processed (since we don’t have to be photographed or fingerprinted), so we cut the queue. I gave my passport and declaration card to the officer and he didn’t say a word; he looked at the passport, stamped it and handed it back and I think he said thanks, but it was barely audible. It seems strange he didn’t ask me a single question, but I guess maybe because I wrote “In transit to Canada” on the card, he didn’t feel like prodding me about details. So out of my four dealing with CBP, only one of them was actually negative. I’ve actually found Canada Border Services Agency people to be quite rude, especially to Canadian citizens. I found it more difficult to re-enter my own country (one I have a legal right to enter) as opposed to foreign countries where I don’t have a legal right to enter, but a privilege. However, since I know I cannot be denied entry into Canada as a citizen, if an immigration officer decides to give me lip or be snarky, I will respond in kind because the worst that can happen is I get delayed with a secondary search (and I don’t mind, because if I have a connecting flight, I always leave a few hours, so I have time to kill). If I’m supposed to be respectful to an immigration officer, I demand the same in kind. Granted, I would never pull this in the US since I’m not a citizen and I’m sure being a prick to a CBP officer would be excellent ground to have the “Removed from the United States” stamp put in your passport. In my travels to Europe, I’ve dealt with immigration for the European Union at Brussels, Keflavik, Lisbon and Hungary (inbound) and Paris, Keflavik, Dubova and Frankfurt (outbound) – they never really ask any questions (except in Iceland they asked how long I would be there – that was it). The only odd encounter was when I was leaving Slovenia to enter Croatia, the Slovenian police were checking passports to stamp you out of the EU and they radioed in the details of my passport and my friend’s passport (as far as I could tell; they spoke in Slovenian and were reading my passport and I caught them saying my name and that of my friend) – we were the only ones they did that to since I’m assuming we were the only Canadians there. After 10 seconds, the guy said something on the radio and then our passports were stamped. I’ve also dealt with immigration in Croatia and the UK; both very friendly. I was surprised at the UK, because I had heard nothing but bad stories from people, but I got lucky, I guess. The IO just asked what I was doing in London, how long I was going to be there and if I had a ticket out of the UK. Unfortunately my experiences have been not so good. My first international trip a few years ago was great… “Welcome home” he said. Ever since they are slow as molasses and could give a crap. I know it’s a job, but get a cup of coffee or something. I will never forget after my first five month trip being welcomed home, then after 14 months the friendly, “Welcome Home,” with a smile thrilled us. This past trip was eight months, so before my wife and I walked through we wondered aloud if they would welcome us. “Welcome Home,” said the man with the smile. It’s a great part of travel to know that you indeed do have a home. Props to those who are so kind to us. I had same experience of you, I had a hard time entering places like UK..
glad it actually went well this time! that other post i’ve read in the past was ridiculous. what a pleasant and welcome surprise, i bet. When I went from Egypt to New York with no return ticket just after the Egyptian revolution earlier this year I expected a lot of crap…. Nothing of the sort, they were pleasant, greeting and pleased to have me visiting and even seemed genuinely happy I was safe!!! Being British with an American partner and the fact that have Middle East stamps often means I get suspicion. Maybe, just maybe we are seeing a shift in behaviour. Hey Forest – Well, I’m not too optimistic about it but I won’t write off a shift in attitude just yet! Glad to know you had a pleasant experience flying into the US as well. NYC can always be a tough one considering how many travelers, both foreign and US citizens, they must process every day. Welcome home Earl! I don’t live to far Ft Lauderdale actually my one of my best friends live off Las Olas Blvd. These are the things that I certainly remember and would enjoy writing about. I think the problem is more often than not people are ready to talk about the horrible little things that happen as oppose to the great little things that do or in this case didn’t happen. I get a hard time when I enter the UK or USA – they really don’t like a few pages of Arabic stamps, and the fact that I’m always alone. I’d love to come across a friendly immigration official. I didn’t think they exist in the west. I had the same experience going from Vancouver to Seattle. US customs were super friendly. There is hope yet! I was once stopped by a sniffer dog in australia who took a fancy to me, that casued some issues, after extensive search of my bags and rubbings taken (with no evidence of anything i might add) the 2 custom guys discussed giving me a cavity search in front of me, i said them “go ahead its been a while since i had another mans finger up my bum” at which point they freaked out and let me go, nothing like a bit of humour to lighten the mood! Luckily I’ve found the experience of returning through Australian immigration as an Australian citizen with a passport full of interesting visa stamps to be relatively easy. I guess that’s a cultural difference, ie Australians travel overseas a lot, and widely, so a busy-looking passport is nothing unusual here. Hey Tim – Australian immigration is usually quite laid-back for me as well. It does seem that extensive travel is more accepted and understood down there! I have only had two experiences with US passport control, but they were both kind of negative. From the experiences of friends and online accounts, they don’t seem to be untypical either. Because of this, I hesitate to take my family to the US and do my best to avoid it myself if other options exist. Sadly, I actually really enjoyed my actual visits, and was struck by the cruel irony that a country with such friendly and courteous people is being represented by a system that allows or even encourages rudeness and arrogance. Before going into things, I just have to say that ESTA is a complete disgrace, and I wish all other countries in the world would implement a reciprocal system. Charging people for visa waivers ‘in order to promote tourism’ is adding insult to injury. My first experience of actual passport control was a visit to Guam. As a British citizen, I was eligible to participate in the Guam visa waiver program. As you probably know, the UK is part of the European Union, and therefore has ‘European Union’ written on the front of the passport. This confused the officer dealing with me, as she could not find such a country on her list of eligible nations. She literally kept me there for 50 minutes despite my increasingly strained explanations, while she consulted colleagues and superiors about the problem. To say I was surprised that the entire passport control shift that day had no idea of what the EU was is an understatement. My second experience was a trip to St. Louis, which I loved. I hadn’t expected to like the US, but ended up having a fantastic time. My passport control experience was fairly normal I think, but I noticed a policy in place that seemed somewhat disdainful towards visitors. I ended up waiting in line for almost two hours (shocking in itself, as I and I presume most others were connecting), but the reason for the wait was the biggest surprise: the passport agents were checking US residents first, then other nationalities once all the US residents were through. The problem is that as subsequent flights arrived, this process was repeated again and again. Now, there were probably not enough agents on duty to deal with the influx of people (this was a O’Hare), but nothing could have sent a clearer signal as to their attitude towards visitors to their country. If I were American, I would be ashamed of how the country handles border security. As I am not, I am merely disgusted and determined to avoid coming into contact with it as much as possible. There are other countries to visit, despite the fact that the US and its people have so much to offer. I hope things get better soon, as I would love to go back. Arriving in America is always a pain & im not even on a potentially suspect passport. The Bahamas on the other hand were very friendly. When I arrived in Nassau the immigration official asked if I wanted a Bahamian boyfriend & winked at me! Hey Liv – Haha, that’s a unique immigration welcome! I love flying in and out of the Caribbean as there is definitely a much more laid-back approach to immigration on most of the islands. It is kind of sad that a friendly customs official stands out as something different from the norm. But I know what you mean. I’m not nearly as well-traveled as you, but I still feel sometimes like I’m being treated as a suspect instead of a citizen upon returning from a trip overseas. I always try my best to be friendly – why can’t the customs officials?? Hey Amanda – That’s the issue. I have no problem with them doing their job but just a reasonable level of friendliness and courtesy should be standard. And as odd as my recent experience was, I really hope it was not a one time stroke of luck! @Nomadic Samuel: Well, if you have nothing to hide than a few questions at US immigration is definitely worth the cheaper airfares. Although I normally try to stay away from the major airports such as JFK. It seems that the airports that receive the most amount of foreign visitors tend to be the most unpleasant in terms of passing through Immigration and Customs. Last time I came back the US, I had a horrible time… I come to Colombia and they welcome me with a smile. But I come back to my own country and they treat me like a suspect. A pleasant customs officer in the US? Earl, I am so glad your travels have finally brought you across one of the world’s rarest species… Unfortunately, this species doesn’t reproduce. Hey Ryan – Haha…yeah, it is not a common occurrence at all. I’ve traveled to Mexico almost a dozen times in the past two years and every time I passed through Immigration in that country, the officer was friendly, relaxed and welcoming. 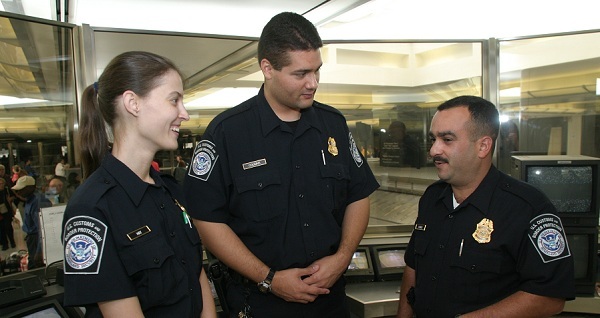 I understand that the US has larger immigration issues to deal with and that the officers must be extra-vigilant but that really has nothing to do with putting a smile on their face and being courteous. I hate how people have to act all Authority and be mean and interrogative through this process! I have always felt they could get the job done just as well or better by being nice! The way you described it is kind of like a casual coffee conversation! haha. That’s how “pleasant” it seems. I know he was asking those questions as part of his job, but it seemed as if he was a friend genuinely interested in your travels. How cool is that! Hey Janet – That’s exactly how it was…just like a casual conversation in a cafe. And he definitely did his job as he asked me plenty of questions. So if this officer can be friendly and efficient at the same time, certainly other officers could manage it as well. Good post at a great time, as I have swirled the idea of traveling to Cuba for the Christmas holidays around in my head. I see that you have not been to Cuba. Is there any particular (aside from the obvious) reason why? I know that I will have to travel to possibly Mexico first then hop on a plane over to Cuba, but it almost excites me. Hey Daphne – There’s really no reason I haven’t made it there yet, and I was quite close while living in Mexico. But rarely do I visit a country where I need to fly in and fly out (as I like to travel overland) although I’m sure I’ll get there eventually. That’s wonderful to hear Earl. My last trip back was a total bummer. Hoping this is something that get’s a full roll-out and I can expect some basic decency upon returning. Hey Dan – I wouldn’t count on it but there is a sliver of hope! It would be interesting to know if there has recently been some training in place or if this really was just a completely random and lucky experience. this is one of the sacriest thoughts I have about traveling the world. I have the interest of travel not just the popular spots f the world but also the unpopular spots. when i read your blog about some of the middle eastern countries that you have been to and i would like to travel to them someday as part of my nomadic lifestyle i would like to live for a while. However I would also like to someday join the FBI and because of this i am afraid to go to some of these nations because i feel i would not get into the FBI. I am fearfull i may be placed on a terrorism watch list r something that would hurt my chances. Live life in fear and you won’t live at all. Hey Brian – I can’t really say how such travel would affect an application to work in the FBI as I’m not sure how it all works. My personal theory is that if you have nothing to hide, it doesn’t matter where you travel. I don’t think that simply traveling to a Middle Eastern country is going to land you on a terrorism watch list. You’d have to do something suspicious that would catch someone’s attention I would imagine. I am an American currently living in Canada, and I haven’t done any travel to countries that might raise any suspicion. Nonetheless, I feel that the Canadian customs and immigration agents are consistently more pleasant when I am entering their country as a guest than their US counterparts when I am returning home as a citizen. I sincerely hope you didn’t contact Customs to praise this agent, as a commendation for being pleasant and professional is almost certainly grounds for termination. Hey Ryan – Canadian immigration officers have been quite pleasant with me as well, although I have heard some shocking stories from other travelers entering Canada. But in general, they do seem to be more understanding of world travel than the US. Oh wow I’m so thrilled you had this experience! I’ve had some interesting customs encounters over the years. Hey Andi – I can imagine with all of that traveling you do. Maybe he reads your blog. I got the same response when i came to NYC this last time. I was dreading it after spending 6 months in India and Nepal but the guy at Newark was cool and thought that me backpacking was awesome. Only real personal question he asked me was “How much do you spend a day to backpack around India sir?” I answered it and he just laughed and said, “I really wish I could be doing what your doing. Here you go and welcome back home. Safe travels sir.” And that was that. Now when I go through Houston or DC I always seem to get the 3rd degree for nothing. Seriously they had me in line one time in DC to declare $10,000+ in currency and I almost missed my flight. I finally started throwing a fit in the line yelling “Why the hell am I in this freaking line… can anyone tell me bc I sure as hell don’t have freaking $10k on me damn it!” I was told at first to calm down but then it hit the guy that I was making sense. I just barley made my connection that time. Hey T-roy – That seems like a most pleasant experience at Newark. Did he really call you ‘sir’? That would be the first time I’ve heard of that level of politeness! In my experience, D.C. is always the worst and I try to avoid flying into Dulles as a result. For a minute there I was going to ask you what on earth you were doing traveling around with $10K in your pocket. That’s great! Do you remember his name? You could write in and tell customs about your experience. Show them what a true professional looks like. I think that this is a great idea. Whenever I have good service somewhere, I always try to send a note to someone in customer service, etc. It’s always good to note and encourage excellent service. Hey Matthew – No, I didn’t get his name unfortunately. I was in too much shock as I kept thinking that my pleasant experience could not really be happening! I always get held longer and asked more questions than the average Joe. Mostly out of curiosity, I think. This one time I was traveling with a friend who gets distracted easily and can come across as an airhead. She was asked what her purpose of travel was and she replied “I don’t know.” Boy did the immigration officials have a field day with that one. It is great to hear about a positive experience with US Customs. It is very easy to complain about the terrible treatment, but it is much more important to celebrate the positive experiences. 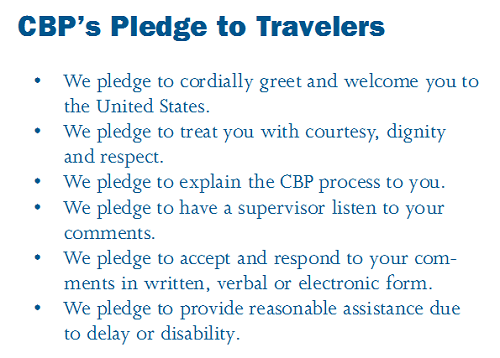 That Pledge to Travelers should be printed on post cards so that travelers can drop it off to customs officers when entering the US. Hey John – It’s interesting because the only place I saw that Pledge to Travelers was on one poorly designed sign (it looked like it was made with the original Print Shop program) that hung near the luggage carousel. I would like to see that sign at every immigration booth, not only for travelers to understand how they should be treated but as a constant reminder to the officers of how they should act. I remember when we arrived in India that there was this family whose kids were literally climbing up the podium that the Indian Immigration Officer used as his desk. He more or less ignored them even though they were treating it like a playground. I thought how amazing this was, because in the US, the officer would have been freaking out. In the US, I wouldn’t have been surprised if someone had been tased, but the Indian officer was totally unfazed. It seems the US customs people are getting more and more like all government officials – rude, inconsiderate and do not care what you think of them. Courtesy and politeness does not seem to be a prerequisite of any government official – which is a shame. Arrogant and rude seems to be the common denominator. glad to hear you met one of the nice ones – they are few and far between in any government position. I have mostly been treated with more respect and courtesy in foreign lands than in my own country. It’s like they are doing me a favor to let me come home. Pretty unfortunate that the country has turned into a “big brother’ mentality.